Human Scale Patterns: Lot Access | whitespace. Note: This is the third post in a series exploring some simple patterns of human scale neighborhood design. These patterns, which I’ve observed in my own neighborhood, have been forgotten or overlooked as we now plan, design and live at the scale of the car rather than the person. 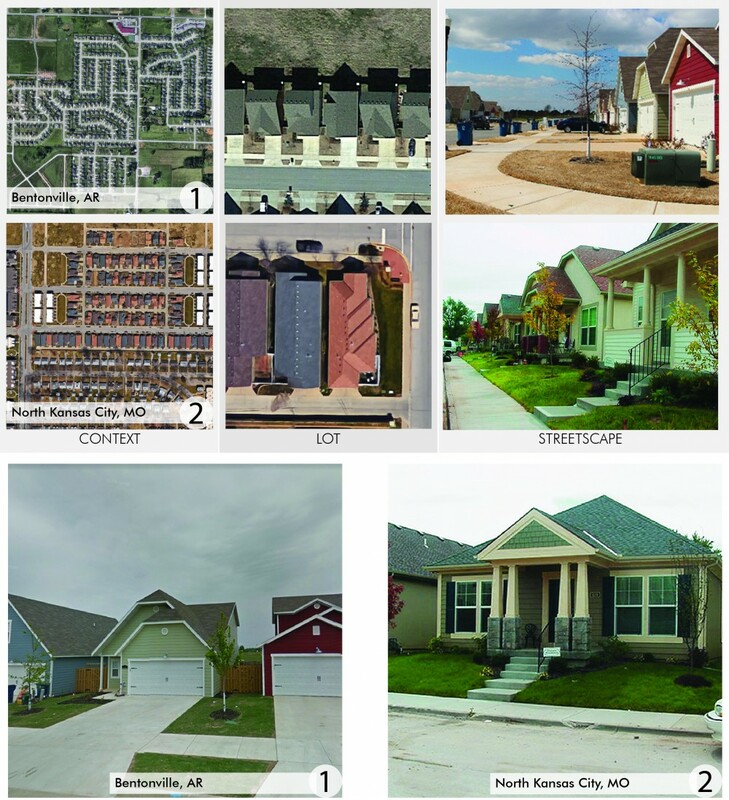 However, these patterns are the key to building lasting value in neighborhoods. The third of the three crucial patterns I’ll explore for designing valuable, walkable neighborhoods– is lot access. Wide driveways are frequent and repeated on each lot, displacing landscape or social spaces. Space for street trees is reduced causing the streetscape to become more barren. Sidewalks are regularly interrupted, making walking less comfortable and less attractive. On-street parking spaces are eliminated by curb cuts, increasing the speeds of traffic on the street and the desire for more parking on the lot (often in the frontage area). Frontages are designed with parking and prominent garages, and are unwelcoming and uninteresting to people. These blocks have similarly-sized lots and houses. However, notice the lot access points and their proportion of the streetscape. The lower image shows single-lane and shared driveways lead to the rear of the lots, creating a more pleasant streetscape and walking environment (Image credit: Google Earth). What may seem like small, individual decisions and rational, personal conveniences has compounding impacts when repeated on multiple lots on a block or throughout a neighborhood. When we develop in compact patterns on smaller lots – a necessity in walkable neighborhoods – these impacts escalate. Each new addition corrodes neighborhood character rather than contributes to it. Too often we mistake neighborhood character with a particular architectural style or aesthetic quality, and then attempt to replicate it without understanding important patterns that are essential to the character of a place. 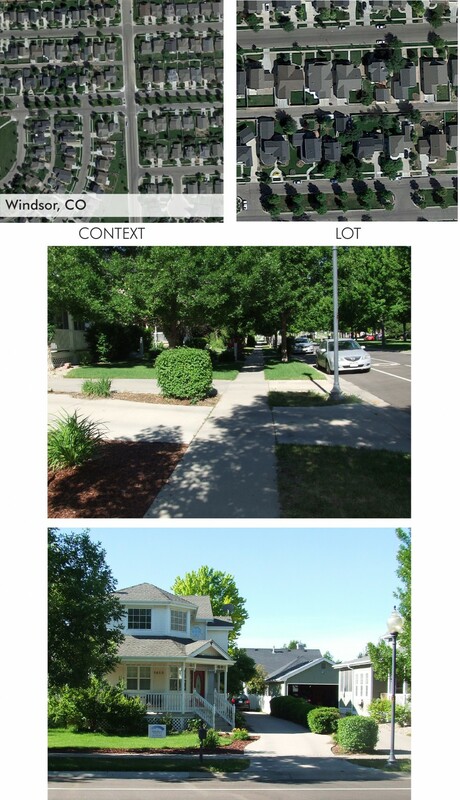 Human-scale lot access patterns – featuring understated driveways and garages – follows some basic principles that improve neighborhood character. 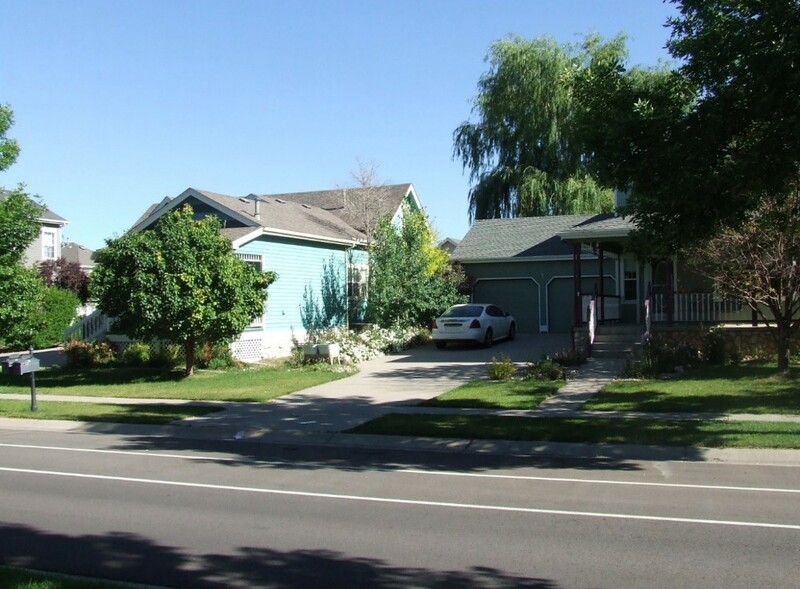 In this example limiting the driveway width within the right-of way alnd lot frontage, and stepping the garage and parking pad beyond the entry feature and living quarters significantly affects how the lot and building relate to the streetscape (Image credit: Chris Brewster, Gould Evans). Limit the driveway access to a percentage of the lot width – generally between 10 percent and 20 percent maximum, with the lower end reflected in more compact urban areas and the higher end found in walkable suburban areas. Use shared driveways, common lanes within blocks, or alleys if available, in circumstances where the general rule limits or eliminates private driveway access. Limit the extent of garages on the front façade. Use alternative patterns such as side orientation, rear “auto courts” or detached garages where larger garage entries are desired. 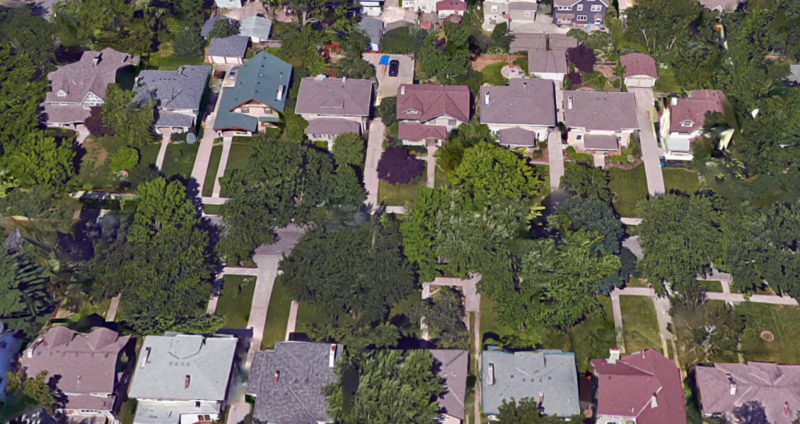 These two neighborhood streets are both aligned by detached houses on compact lots. However, the streetscape differs due to the design of lot access. The neighborhood street in Bentonville, AR contains front-loaded double driveways, while the houses in North Kansas City are back-loaded, accessible by a shared alleyway. (Image credit: Chris Brewster and Abby Newsham, Gould Evans; Google Earth). This neighborhood in Windsor, Colorado combines front-loaded private drives (both single and double) with back-loaded alleyway access. 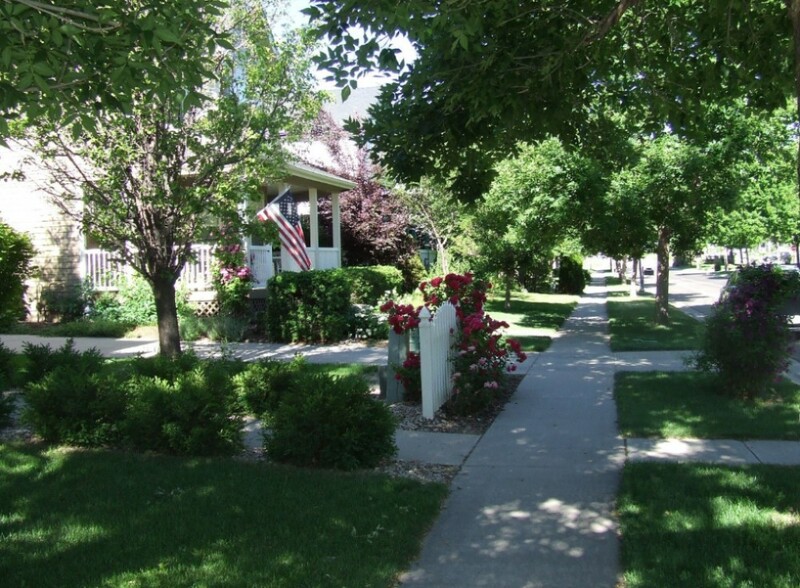 Interruptions in the streetscape are minimized, and the neighborhood provides a variety of lot access types. (Image credit: Chris Brewster and Abby Newsham, Gould Evans; Google Earth). If we deviate from these rules and patterns, we are not designing human scale neighborhoods. Instead, we are accommodating the car at the expense of the public realm and neighborhood character. Human-scale places are at the root of what people truly value, and while access, parking and accommodating new needs of homeowners are important, it can be designed in a way that offers all the conveniences of car ownership, but still prioritizes engaging streetscapes. Understated driveways and garages help emphasize the person over the car, and help support other crucial patterns of neighborhoods designed for people. What kind of human-scale patterns do you see in your own neighborhood? Let us know your thoughts in the comment section below. Chris, you should include some of what you have done with the PV Phase II. I think the quantitative design, or human scaled forms, takes the discussion to the building and form level. Also, I would like to share with you some of the patterns I am exploring for our new suburban developments. They integrate social activities and patterns, increased requirements for greenspace and build off the city and infrastructure requirements and patterns which define the patterns for suburban development.